IMPROVE YOUR PASSENGER EXPERIENCE DURING THE HAND BAGGAGE WEIGHT AND SIZE ANALYSIS PROCESS AND IMPROVE THE SELF-SERVICE EXPERIENCE. Introduce innovation in an outdated process. Solve one of the most important pain points for passengers, airports, airlines and Ground Handlers companies. Help to improve the airport operations. One devices fits all the airlines hand baggage policies. Common use kiosk. Help to charge the hand baggage fee if applicable and due to this help to increase revenues for airlines and airports. How could our device improve airports operations? Improve airport operation and the passenger experience. Diminish the number of cabin baggage at gates and doing so improve the airlines OTP. Eliminate sizers from the terminals and the time moving it. Facilitates baggage storage due to you´ll have photo of every carry-on baggage. Contribute to the Improvement of the handling agent experience. Help your customers to collect the gate bag fee. Provide more options for self bag-tag printing. Help to accomplish with your KPI. 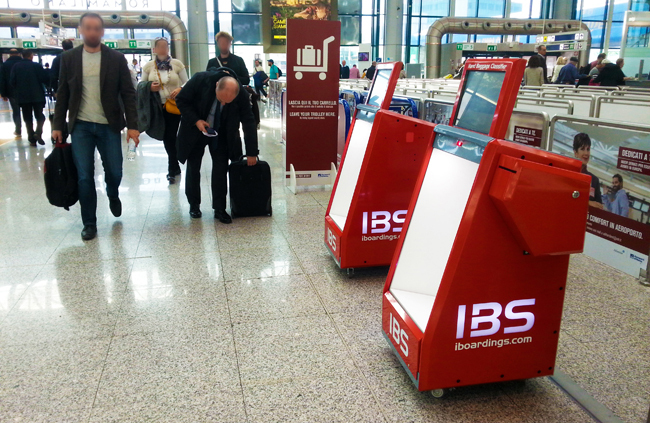 Imagine if a passenger doesn´t have to fight against the sizer to verify his hand baggage during the boarding process. Imagine a process without disputes between the passenger and ground handling staff by the hand baggage´s weight and size. Imagine that you know the exact moment the cabin room for hand baggage is full. Imagine that from that moment on our device supply different tags in order to have the hand baggage taken to the airplane hold. Imagine that you can help the airlines to eliminate the on-board hassle derived from a full cabin for hand baggage, taking the measures outside and preventing excess occupation, since it is the device that decides from what moment on the hand baggage is sent to the hold, and issuing the hold tag. Save time during the boarding process because you know the exact moment the cabin room for hand baggage is full and you can decide from this moment on to send the hand baggage to the airplane hold supplying the device the hold tag for the airplane hold. We develop innovative solutions for our client´s problems, applying new "out-of-the-box" approaches to face new complex problems. Our solution introduces innovation and improves the passenger experience in an outdated process that produces disatisfaction. We provide a service. We make the investment for our clients and we provide everything it takes for a full service deployment. We are open to assess clients in facing and resolving their problems.